Today Suffragette is released to cinemas around the country, and we are celebrating with this second blog from one of the film’s rather special ‘extras’ Peter Barratt. 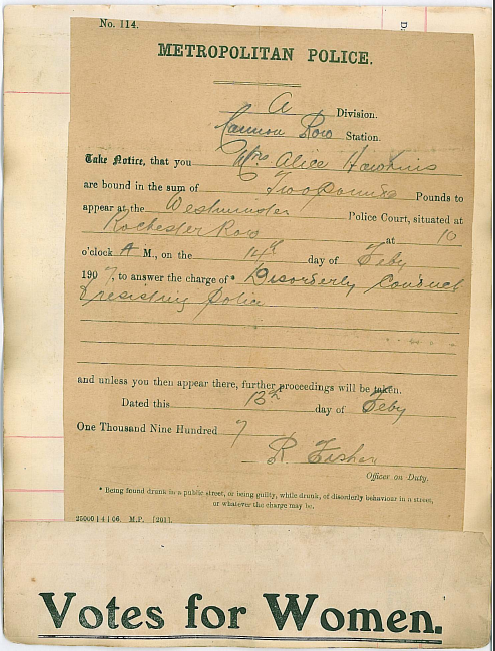 Peter’s great-grandmother was WSPU member Alice Hawkins. Alice was an extraordinary working woman who made things happen. My great-grandmother Alice Hawkins was a working class suffragette of a 100 years ago who was first arrested outside the Houses of Parliament in 1907, on the day of the State opening of Parliament. 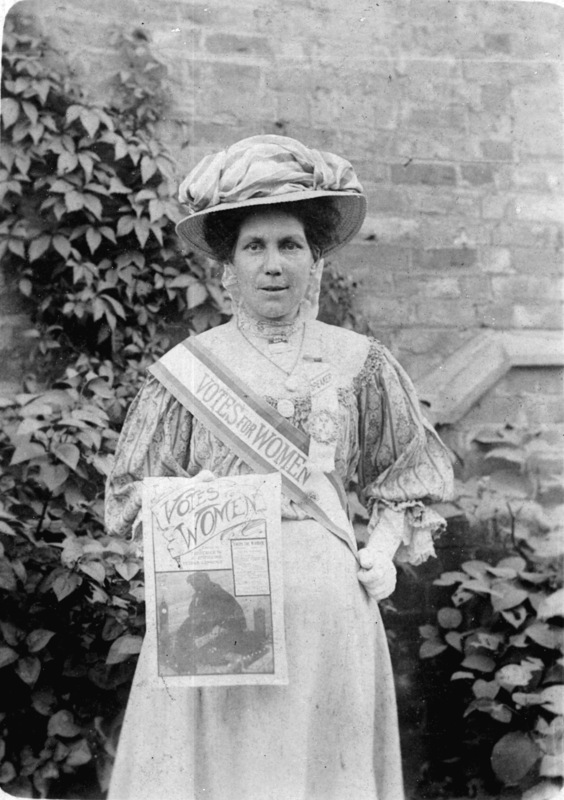 A shoe machinist by trade, Alice formed the Leicester branch of the WSPU in 1907 with the help of the Pankhurst sisters and went on to be imprisoned five times in her campaign for the vote. On hearing this, Sarah Gavron, Director of the new film ‘Suffragette’ invited I and my daughter Kate to be extras in an interior scene filmed in Parliament on Saturday 5th April 2014. What neither Sarah nor I would realize was that the most incredible coincidence would follow. At the start of the day Sarah assembled cast and crew together and briefed on the scene to be filmed. 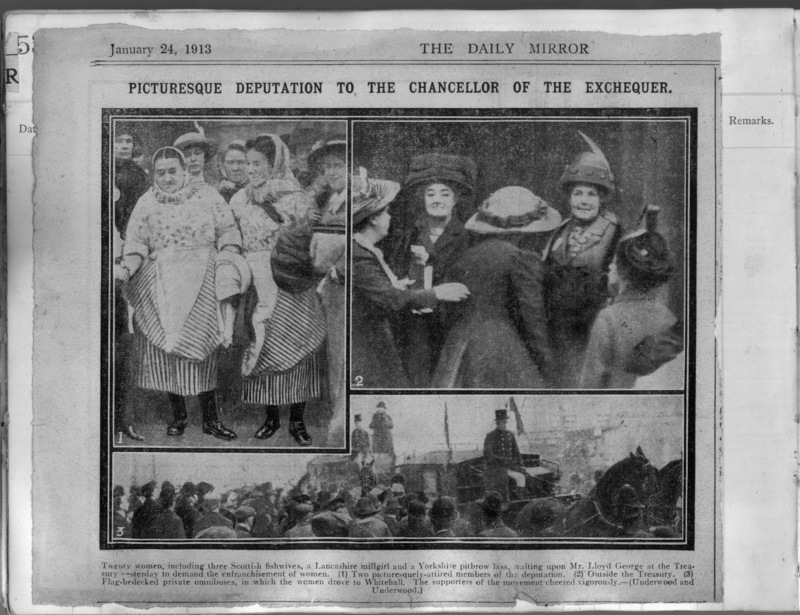 Explaining that the writer, Abi Morgan, had based the scene on a true event from January 1913 when working class suffragettes came to the Treasury to put their demand for the vote to Lloyd George, a Cabinet Minister. Sarah asked for any questions. With this I stood up and said that not only was my great-grandmother a suffragette, but Alice had been there in that very scene a 100 years ago. Alice had even kept newspaper photographs from the day showing her and fisher wives from Newhaven waiting on the steps of the Treasury, ‘waiting to see Lloyd George’. It was a fantastic coincidence to find that I and Kate would be reenacting the very scenes from our ancestor and the whole cast and crew cheered on hearing the news. It was a great life experience and imagine my surprise to be invited to a private screening of the film in June 2015. Not only a warm gesture on the part of the producer, but a nod to the campaigning work of Alice Hawkins. The descendants of Alice collectively still have much of the suffragette memorabilia that once belonged to her, including her sash, hunger strike medal , prison notes, letters from the Pankhursts and more. I now speak to groups, societies and schools on a voluntary basis and always finish my talks with the words of Alice to my late mum, her grand-daughter. Alice said ‘you must use your vote, we suffered for it’. Mum said that she always voted and that her granny would turn in her grave if she didn’t. 3. Newspaper cuttings from January 2013. Alice is the lady with a feather in her hat.